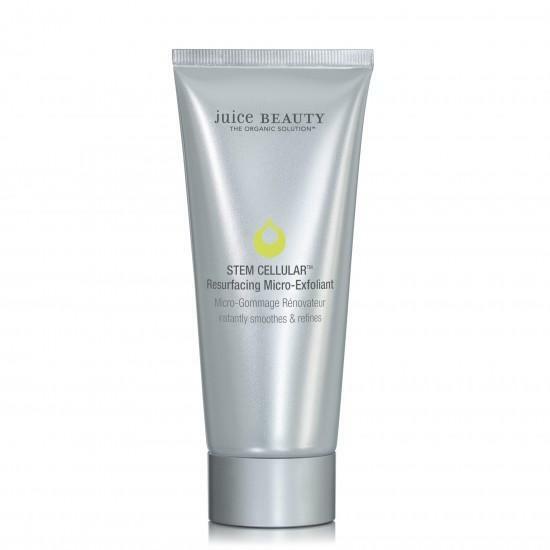 Juice Beauty Stem Cellular Resurfacing Micro-Exfoliant is an intensive spa grade microdermabrasion that helps resurface to visibly reduce fine lines and even out the skin tone, revealing smoother and younger looking skin. This is an alternative to conventional chemical dermabrasion or regular microdermabrasion. The effective formula is made with certified organic ingredients, clay and jojoba micro-particles that gently resurface, smooth and soften the skin. This has been specially formulated for those looking for an instant treatment to minimize the appearance of fine lines and wrinkles. This is not suitable for sensitive skins. It reduces dead skin cells, instantly resurfaces and refines with exfoliating grapeseed micro-particles. It replenishes, restores and renews with a proprietary blend of fruit stem cells, which have been infused with an organic resveratrol-rich grapeseed base. It softens and moisturizes skin with Vitamin E. Also, it soothes post-exfoliation with chamomile and aloe vera. This product has been formulated without any parabens, petoleum, propylene, butylene glycol, sodium lauryl sulfates, pesticides, phthalates, artificial dyes or synthetic fragrances. Also, Juice Beauty never tests on animals. To use: Massage onto a moist face, neck and décolleté with fingertips in a gentle circular motion. Remove with a warm, damp washcloth. Pat dry. Wipe away particles. For the best results, use 2-3 times a week. How well does it work? This is an EXCELLENT exfoliant. Not only does it exfoliate extremely well, by getting rid of the extraneous dead skin cells, it leaves skin feeling very soft and pleasantly smooth. Also, it does not over exfoliate the skin, like some microdermabrasion scrubs do. This product is so easy to use and the exfoliant in it is not too abrasive either. That is what makes this a good product. I would definitely not recommend this for sensitive or acneic skins, but otherwise any other skin type can use it. I love how it smells too, as it is made with natural and organic ingredients. It is also loaded in anti-oxidants, so it is also an age defying product. Scrub, leave it on for a few minutes and you have yourself a mask that acts as an age defying anti-wrinkle product. Juice Beauty is one of those companies that does amazing things with skincare. I love their products and this is just another stellar addition to their winning lineup. I love that the Resurfacing Micro-Exfoliant helps to really get a good exfoliation on my skin without being too harsh. The fact that it can do this while claiming to be a microdemabrasion product is truly amazing. I think what helps with this is the addition of clay. That helps to soften the product and allow it be softer on the skin. Either way, I know you will adore this product as much as I do. Juice Beauty Stem Cellular Resurfacing Micro-Exfoliant retails for $55.00 and is available online at www.juicebeauty.com, and anywhere that Juice Beauty is sold. Like Juice Beauty on Facebook:https://www.facebook.com/JuiceBeauty; Follow Juice Beauty on Twitter:@juicebeauty; Follow Juice Beauty on Pinterest:https://www.pinterest.com/juicebeauty/; Follow Juice Beauty on Instagram:https://www.instagram.com/juicebeauty/ and Subscribe to Juice Beauty on Youtube:https://www.youtube.com/juicebeauty.